Pope Francis has cancelled the annual meeting of the Papal Foundation, which includes an audience with the pope in Rome. There has been a schism over a significant grant request, a grant of $25 million to fund Istituto Dermopatico dell’Immacolata (IDI), a hospital in Rome. That request came from the pope. The Papal Foundation is an affiliate of the United States Conference of Catholic Bishops, whose 501c3 designation was issued in 1946. (Michael Wyland discussed some of the troubles of the foundation last month.) There are almost 17,000 other affiliates. Though there is limited financial information available for church-based organizations, the Papal Foundation self-reports, issuing an annual financial report. The foundation is 28 years old and has assets of $206 million. The foundation’s executive committee of the board of trustees is composed of active and retired cardinals who live in the US. The full board includes eight people who are laities, as well as bishops. In 2016, it received contributions of $6 million, $3 million of that from new “stewards,” and granted out almost $10 million. In order to be considered a steward of the foundation, one must commit $1 million to be paid in no more than ten years, at least $100,000 a year. The request for $25 million for the troubled hospital was leaked to the press in February. The usual grant from the Papal Foundation is no more than $200,000. It has provided over $120 million in scholarships and grants since 1990. 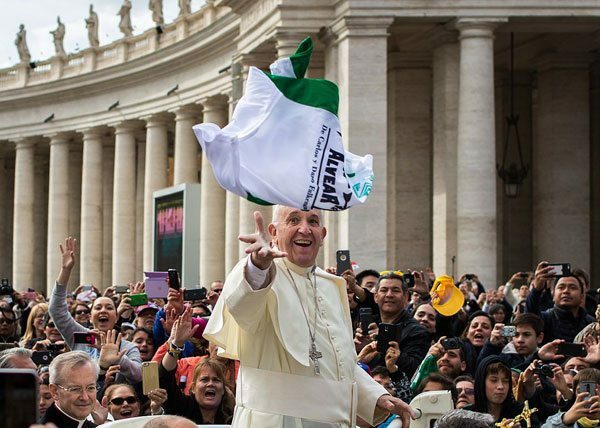 The foundation will still have its yearly pilgrimage to Rome from April 11–14, according to a press release issued by the foundation. The 2016 pilgrimage cost the Papal foundation $86,000. While Istituto Dermopatico dell’Immacolata is the leading hospital in Rome to treat cancer, with over a thousand employees, it is plagued with problems and scandal. The hospital declared bankruptcy in 2011, with reported debts in the neighborhood of 600 million euros (about $745 million today) and employees going months without paychecks. Both Pope Benedict XVI and subsequently Pope Francis changed the hospital’s governance. The leader of the hospital at the time of the bankruptcy, Rev. Franco Decaminada, was arrested along with two others for stealing about $17 million from the hospital for their own use. When the hospital grant information was leaked to the media, it included a memo from the chairman of the foundation’s audit committee, James Longon, that noted “the IDI hospital had been a media and legal disgrace with embezzlement and fraud and bankruptcy” and alleging that the foundation’s board of directors approved the $25 million grant with “no professional due diligence.” Longon resigned from the committee after the memo became public. A source told the National Catholic Reporter that the pope offered to make no other requests during the time the hospital grant was being paid out, which was said to be three years. The trustees did not require that and paid $8 million in December and $5 million to other Vatican projects in January, which is more than they brought in as revenue the year before. According to the source, the Catholic Health Association reviewed the hospital’s management and books. “The bulk of the review focused precisely on the current state of the hospital” and the Vatican’s assurances that the entire grant would be used for hospital operations and not to pay off its debt, most of which the Italian bankruptcy court assigned to the religious order and not the hospital itself.